These units are still excellent today, were built with the highest quality commercial parts available at the time, and were used in many Labs throughout the country. They are inexpensive today and show up at swapmeets, on e-Bay, and in the dark corners of a shop/garage. The main reasons they are not being used is that they don't work or people don't understand the value of "Q". "Q" is the ratio of the induced voltage (e) to the voltage (E) developed across the reactance at resonance (Q=E/e). If the induced voltage was 20mV and the measured voltage across the reactance is 5V, the "Q" is 250 (5V/.02V=250). Higher circuit "Q" improves selectivity and gain (and the converse is true). You can measure the effect of various toroid core materials for a given inductance, measure the effect of increasing the inductance and lowering the capacitance at a given frequency, or see the effects of different dielectrics on inductors ...airwound vs ceramic forms vs an old paper tube. For an example of use, see the "Coil Winder" section on the first page. The "Loaded Q" in the actual circuit will be substantially less than the "Unloaded Q" measured here, but all the advantages of higher "Q" apply. A manual for the Boonton 260-A and one heck of a lot of other stuff is available from me on the HBR Receiver CD for $10 postpaid in the US and $12 Worldwide. The Boonton 260-A is made up of several units: 1) a stable oscillator with a range from 50KHz to 50MHz, 2) a "no inductance" .02 ohm resistor across which the induced voltage (e) is developed, 3) a heater/thermocouple assembly to set current into the .02 ohm resistor at a known level on a meter, 4) an accurate variable capacitor to adjust the circuit to resonance, 5) a high impedance RF voltmeter to read the voltage (E) across the reactance and translate that to "Q" on a meter, and 6) the power supply. For calibration and to use as "work coils" I made up a coil set from some forms and shield cans found at a swapmeet, attached two bananna plugs, and grounded the shield to the "LO" plug. Calibration of the coils over the frequency range can be done against a known accurate Q meter or using the calibration proceedure given below. The oscillator may have the usual problems: leaky capacitors, bad tube, broken wires, etc. Some range selector turret coil wires may have corroded (after 40 years) where they attach to the turret contacts. You may see the green color inside the sleeve. Resolder any broken wires. The turret contacts also oxidize and are apparently made of brass, which will require some extra cleaning. An out of spec frequency range on a given band is a common problem. Use a frequency counter to check it ......some bands may be off only 2-3%, some may be off 20%. The individual frequency strips have small capacitor adjustments, but the slugs, which you really need for gross adjustments, appear to be sealed and should be a real headache to adjust. I left mine alone and taped a conversion chart to the top of the unit for the two bands which were too far off. This is generally good enough and if you require more accuracy, use a counter. The "no inductance" resistor (looks like a large disk) is part of the heater/thermocouple assembly. It's a hearty beast and even if it changes value a little, the XQ Controls can compensate for it. The rationalle for using a heater/thermocouple to measure current is that it is basically unaffected by frequency ..."amps is amps", "watts is watts" and you need to measure a fixed current into a very low ohm resistor (.02 ohm) to establish the induced voltage (e). This is one of the problem parts and you may well find it defective. If you see no indication on the XQ meter as you advance the XQ Controls on any frequency range, the oscillator isn't working or you may have a defective heater/thermocouple. A quick check of the heater/thermocouple assy (aluminum block under the gold plated terminals) is to measure from the BNC connector center pin to the LOW terminal, if that's open the heater/thermocouple is bad. If it's OK, measure from the LOW terminal to Ground with an AC RMS millivoltmeter (HP 3400, RCA WV-74A, Heathkit AC Voltmeter, etc). Use an oscillator frequency the voltmeter will handle (1-5Mhz for the good RF millivoltmeters, 500Khz or less for the audio millivoltmeters). The LOW terminal should measure 20mV when the XQ meter is at "X1" (1.0Amp into a .02 ohm resistor provides 20mv for reference). NOTE: whenever switching bands or for initial settings don't adjust the XQ meter above half scale. The heater portion CAN burn out if the red section of the scale is exceeded for an extended period. Also adjust the XQ Control slowly, it takes the heating element time to respond. Remove the heater/thermocouple assy, being carefull when unsoldering the flexible lead to the LOW terminal. It's easy to break if you don't know that connection is there (it's on the oposite side from the BNC connector). Take the heater/thermocouple assy apart and examine it under magnification. A bad solder joint can be repaired, a burned heater or thermocouple wire can't. You should measure less than 1 ohm across the line (RF signal) terminals and across the +/- sense wires. If you measure "open" across any of those terminals, you have a bad heater/thermocouple. It's apparently not an uncommon problem, the heater/thermocouple was bad on mine. Bigger problem ....finding a suitable replacement if you can't find another Boonton 260A (the Boonton 160A uses a different heater/thermocouple). I tried several "RF detectors" which were OK for relative "Q" measurement by setting a fixed/repeatable voltage level, but they were not accurate and readings droped off rapidly at higher frequencies. Finally settled on the heater/thermocouple assy out of an ARC5/RE-2 antenna current meter (also in several other old military units). These heater/thermocouples (rectangular, brown, approx 1" x 2" x 3/4") are available in surplus and in junk boxes because no one had a need for them but you couldn't throw it away. In the ARC5/RE-2 they are link coupled and would make good wattmeters if driving a known resistive load (52 ohms or ?) with the proper meter scale ....but that's another topic. The "antenna current" meter may show 0-10, 0-1, etc ....all the ones I checked had .75A heaters. I've tested both General Electric and Weston Electric Inst. heater/thermocouples. They are military "stressed use" items which typically have substantial specification margins. So......ran the heater up to 1.0A and held it for 30 minutes (30% over spec), up to 1.25A for 10 minutes, and finally up to 1.5A (100% over spec) for 1 minute and saw no negative effect. Just to give you an indication of current relative to XQ meter readings ...."X1" is 1.0A, bottom of the "red" region is 1.025A, meter pegged is 1.1A. I Replaced the defective heater in the old assy with a piece of wire from the BNC center conductor to the .02 ohm resistor and reinstalled it in the Boonton 260-A. The ARC5/RE-2 heater/thermocouple assy was installed in a small minibox and cabled up between the oscillator and the old heater/thermocouple assy. It is very important to use good wiring practice, short leads, and good grounding. Resistors were added in series with the thermocouple output so 20mV from LOW to Ground measures "X1" on the XQ meter scale. This turns out to be 72 ohms for my unit. I used the existing XQ meter wirewound resistors which measured 25 ohms in one leg and 26 ohms in the other leg, added a 21 ohm resistor for the required 72 ohms and wired a .01 mfd disk capacitor from each wirewound resistor to ground on the meter side. Do not ground either thermocouple wire or you may see some grossly inaccurate readings, especially on the higher bands. Measuring a "Q" of "220" on the Q Voltmeter with "X1" on the XQ meter, the XQ meter was lowered to "X2" ....and the Q Voltmeter read "110". Surprising linearity correlation to the original Boonton heater/thermocouple for that frequency. Works for me. Standard 518A-2 at 5.0Mhz, 10.0Mhz, 15.0Mhz measured high, apparently due to a frequency non-linearity or wiring of these add-on heater/thermocouples relative to the integrated Boonton units. However better than 5% accuracy can be attained by setting the XQ scale, not to "1", but to "1.03" for around 5Mhz, "1.1" for around 10Mhz, and "1.2" for around 15Mhz. I suspect the same will hold for higher frequencies but had no calibration standards for those. The variable capacitor and it's verniers are excellent. The only thing to watch is making sure the wipers make proper contact after 40 years. There really isn't anything to go out of spec. The voltmeter uses a unique calibrated tube (535-A) especially made for Boonton. It has a specific linearity to match the Q Voltmeter scale and uses a very high grid input resistance (100M ohms). The tube is used at low filament voltage and should last a very long time ...if it doesn't get gassy and you don't drop it. The tube is basically a 1659 "type" and as long as it will calibrate properly (or change the scale to match the tube), I would use what is available ...finding a good 535-A (other than in another Boonton Q meter) is difficult. Q Voltmeter Calibration is done by applying a 20Khz signal between the HIGH and Ground terminals. A 20Khz signal is used because most Audio Signal Genators can easily supply 5V RMS and most RF Signal Generators can't. The XQ Controls should be set to "minimum" since the Boonton oscillator is not used for this calibration. For Signal Generator RMS voltages of 5V, 4V, 3V, 2V, and 1V the Q Voltmeter should read 250,200,150,100,50 respectively. Adjust R310 (Q Adjust) on the back for the best readings. Adjust R308 for the best readings with 1.2V, 1.0V, 0.8V, 0.6V, 0.4V, 0.2V which should read 60,50,40,30,20,10 respectively while pushing the "LOW Q" lever. The controls as viewed from the back, left to right, are: R312 (Q Meter Zero), R308 (Low Q Adjust), R310 (Q Adjust), and R306 (Delta Q Adjust). If the voltmeter moves erratically, check to make sure the bare grid lead to the tube cap is not touching the housing where it passes through. Check the "usual suspects" ....bad electrolytics, rectifier tube, regulator tubes, etc. The large transformer in the back of the unit is a constant voltage device. If it's bad, just bypass it at the 4 pin connector on the main power supply chassis. I've come across a much better method for determining accuracy per a note from Erwin (W2FTN) which requires no "standard" test coils. This has been verified against two known accurate Q-meters and seems to work well. Q is also defined as the ratio of the resonant peak frequency to it's -3db voltage bandwidth. The accurate frequency counters available today, make those measurements easy. For example: for a given 4000KHz resonance the meter indicates "157" on the Q scale of the voltmeter, so 0.707 voltage would be at "111" (a 0.707 voltage ratio is -3db, a 0.5 power ratio is -3db). Measuring the frequencies at the two "111" points gives 4013.5KHz and 3983.3KHz or a 30KHz BW. Dividing 4000Khz by 30Khz gives 133.3 as the calculated Q. The Q meter can now be readjusted to show "133". There are some linearity assumptions made for the Q meter scale, but this method is better/easier than anything I've come across. Four coils were wound by hand. Coil Q will increase if the turn-to-turn capacitance is reduced. This can be accomplished by using a "basket weave" pattern. The "basket weave" coils have roughly 1-2 spool length traverses of the wire per revolution of the spool (coil Q will be even higher on fixed pattern wound coils made using a coil winder). Q can also be increased by using multi strands of smaller gauge wire due to increased surface area (skin effect) at frequencies below about 3Mhz. It's a substantial improvement in Q to use two strands of #39 AWG vs one strand of #36 AWG, or better yet .....six strands of #42 AWG vs one strand of #36 AWG. All three of those examples have the same current handling capability. Many small, higher quality, IF transformers are wound with two strands of smaller gauge wire. 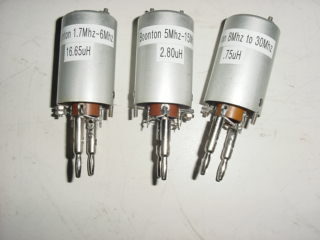 Larger, high quality IF transformers are wound with Litz wire, dipped, etc. All coils were trimmed to 2.0 mH with no slug, and 3.0 mH with a slug. Q Data is "unloaded Q" as measured on a Boonton 260-A. Other factors which effect coil Q are the coil form material and the adhesive used to hold the windings. Any coil form which can absorb moisture, like the old cardboard oatmeal boxes and toilet paper tubes used for crystal sets, is a problem unless the cardboard is treated with varnish, shellac, etc ....but it's cheap. Use a light coat of clear fingernail polish to hold windings (strips across windings didn't work), Q reading 15-20 points lower when first applied, above readings are after 48 hours. The highest Q coil for a given inductance is "air wound" with space between the turns (less turn-to-turn capacitance), the next is space winding on a good coil form (ceramic, phenolic, etc). Space winding on a coil form by winding string or another wire along with the coil wire and removing the "spacer" later is good. Ceramic and some phenolic coil forms came with wire groves to space the turns. You do have the problem of having to stabilize the separated turns with Q-Dope, paraffin, Duco cement, etc. Granted, these are unloaded Q measurements on a Boonton 260-A and loaded Q will be less, however the improvement will be carried over and the "trend" is there. Sensitivity ...the Boonton uses a 20mVAC "e" signal and measures "E" with a very sensitive voltmeter, so a Q of "107" means "E" is 2.14VAC ....a Q of "175" Q means "E" is 3.5VAC ....higher sensitivity. Selectivity ....Q is also the -3db voltage BW divided into the frequency (Q = Fo/-3dbBW ...or -3dbBW = Fo/Q). For a Q of "107" the -3dbBW is 31.8Khz. For a Q of "175" the -3dbBW is 19.4Khz .....better selectivity. "E6000" Craft Glue was used on a coil with a Q of "175" ...absolutely no change in Q as you put the material on, as it dries, or 24 hrs later, even for a very heavy application of glue. I believe it's some kind of silicone based product .....waterproof, clear, and remains flexible. My wife didn't even tell me she had some "really good coil dope" material in her crafts pile. "CG Clear Ice" fingernail polish was used on a coil with a Q of "107" and the Q dropped to "97". Relative Q meter readings on a properly functioning Q meter are far more important than absolute accuracy when you are working to improve a circuit. 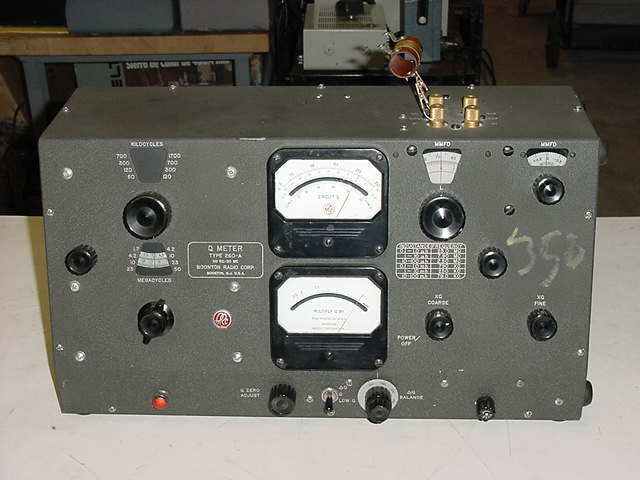 Nearly all the following information comes from Erwin (W2FTN) who worked for HP (bought out Boonton) for 33 years in Customer Service and has first hand experience on the subject of Boonton Q meter operation and calibration. He also related how Boonton (and several other companies) were the result of George Bakelite gathering a few good Engineers to investigate the properties of his new plastic material. The HP4342A and 260A both read circuit Q, influenced by various losses in the measuring circuits, which are completely different. The measurement differences, however, are only a few percent. Sometimes oscillator harmonics can cause a slightly low reading, since the thermocouple sees all energy while the tuned circuit only sees the fundamental. The 160A Q-Meter had this problem but caused at most a 3% error and only at some low frequencies. If you find a used voltmeter tube, buy it. If you find a scrap Boonton 160A, buy it for the voltmeter tube which is basically the same as in the 260A. HP was selling them for over 50 bucks at the end, from the last production run before RCA closed its tube plant. The Q Voltmeter tubes were selected to meet a series of specifications. Tubes for the 260A had tighter specs - I think gas current, gm, input capacitance and maybe a bit more. Occasionally there were tubes from RCA that didn't pass at all - they went to the surplus market and were sold as 1659. We tried buying tubes from the open market after RCA stopped making them and found very few were OK - thats how we found out where the rejects went. At this point in time this is all moot, of course. it doesn't matter where the tube came from. One of the design goals of the 260A was to reduce the output variations vs the 160A. Also to lower harmonics, better injection resistance, and a thermocouple that had more tolerance to short overloads (the 160A used 0.5A TC and a .04 ohm metallic strip resistor, folded back to cut inductance. The standards are built into a shielding can and wound on a ceramic form, temperature cycled to stabilize them, then tested and shunted with resistors so none of them have Qs greater than 250. The calibration is done on a 260A with very well-known history and actually compared to coils that have data from Bureau of Standards in Boulder and themselves having a long history. Unless a Q-coil is physically abused, they should be pretty stable. The 513A is the best one to use because it is more rugged, sealed with helium inside, used at 1MHz and was looked upon as a standard for basic calibration. There were a series of other coils made that were called "work coils" with a whole range of inductances for use in measurement applications to periodically verify proper Q meter functiong at that frequency range. The 103A coils were "work coils" and the Q values were only approximate, since the user could measure the actual Q with their Q-Meter. About the oscillator coils - they were "set" with GE Glyptal cement. Only an acetone soaking will (maybe) dislodge them. Usually they break. We used a piece of 0.010 across-the-flats hex steel stock brazed to a 6" long brass rod to get into the coil and to move the slugs, then followed it up with a plastic tool for actual adjustment. I wouldn't recommend this to anyone. Live with 2-3% error. We found vaseline helped on the contacts, but the heat-treated beryllium copper fixed contacts sometimes did a job on the pins.